Always a leader in innovative solutions, New York City has created the Center for Faith and Community Partnerships in order to "transform the way in which faith organizations and other community organizations access City services." It will serve as "a direct line to City Hall, connecting local and citywide coalitions of leaders to services that increase equity and inspire civic engagement throughout our neighborhoods." 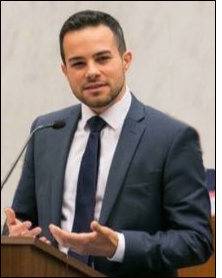 The New Sun interviewed its Executive Director, Jonathan Soto. Lese Dunton: Could you give examples of what you've done so far? Jonathan Soto: The Center's first piece of engagement we did on MLK "Weekend of Action" at The Riverside Church. Rev. Amy Butler was gracious in inviting us. She is on one of our clergy councils. Our efforts were to enroll folks in the Affordable Care Act before the deadline. We brought resources from our city: the commissioner on human rights, reframing religious liberty, our NYDC program. We had enrollees towards end of the service. JS: We had another Weekend of Action program with First Lady Chirlane McCray last May. She launched Thrive NYC, which is the city's mental health roadmap. We wanted the faith community connected to not only the mental health services, but to be active participants in promoting mental health, and de-stigmatizing it in houses of worship. So over 1,000 houses of worship participated in that weekend. Speaking from their temples, mosques, synagogues and churches. It was about the free mental health services we provide, and in addition to that we also enrolled faith leaders in what we call "Mental Health First Aid Trainings." It's a really fantastic way of viewing collaboration between the communities and City Hall. People actively spent the day listening to the perspective of mental health professional saying that in your congregation or in your community you may have someone who's suffering, and maybe the approach you've taken up until this point hasn't been the best, but being able, from a mental health practitioner's perspective, to de-esculate, de-stigmatize, and connect them to services, is a way that successfully brings out the desired outcomes. De-stigmatizing mental health issues and connecting individuals to services. That's something that we did and we want to continue to do. We trained 150 faith leaders in Mental Health First Aid (The New York Times did a nice profile on it). And that was just one of the ways we engaged. The city has all these innovative programs that a lot of folks on the ground are not aware of. Secondly, there has been this issue with houses of worship and space - whether there are under-utilized parking lots, or under-utilized air rights. Some are approached by developers and many of them losing their place at bad deals because they lacked the technical assistance or the expertise to engage in new deals. We've seen the development of luxury housing leading to a lot of the causes gentrification. So one of the programs we recently launched with Local Initiatives Support Corporation (a non-profit that promotes affordable housing), provides technical assistance to houses of worship that wanted to create low income affordable housing. We finished that program recently. There's going to be 5 or 6 that get granted these funds to be able to develop affordable housing in their communities. We wanted to take an anti-displacement approach on houses of worship. They are rooted in their communities; they have rooted the storm of gentrification, so it's a natural kind of synergy to engage with them, to support these initiatives. Those are just two examples of many of us being able to partner with constituencies that may often be ignored or the city, or the city doesn't understand their value. Having these conversations, first through the Clergy Advisory Council, and now more formally with the Center for Faith and Community Partnerships, is something we're really excited about. The two-stated purposes of the Clergy Advisory Council, when it was formed a year and a half ago (July 2016) was to improve the delivery of city services and to assist the city in policy formation. We see a fusion of these two elements: where we have this conversation between stakeholders in the community and City Hall, and are able to identify new ways to make our outreach more efficient. And leverage the under-utilized capacity of houses of worship. It's been a fruitful partnership. LD: In a perfect world, how do you envision the future of the Center? I really want to see a greater understanding and dialogue of the value of partnerships between faith organizations and community organizations come out of this. I think sometimes the faith community could view the community organizations as, "Well, our missions are somewhat related but we don't understand the points of synergy and how we could collaborate." My goal is really to not only get them collaborating, but also be able to strengthen the resiliency of the neighborhoods that they operate in. So, how do we flesh this out? Part of the work of the new center is to promote the existing initiatives that the city is bringing out. For example, being able to have a faith leader go to their congregants and say, "Hey, the city is providing free legal protection for tenants that are being harassed. If you want to speak to a lawyer we're providing for free, you can partner with the Safe Organization or the Organization for Anti-Harassment, that's around the corner, who we were introduced to by the Center of Faith and Community Partnerships." The city has all these innovative programs that a lot of folks on the ground are not aware of. Creating those collaborations and relationships - it's really my dream to be able to see that happen. The Center will launch a website soon. In the meantime, you can follow the Mayor's Community Affairs Unit on Facebook by searching @NYCMayorsCAU or visiting http://www.nyc.gov/html/cau/html/home/home.shtml. They will announce the launch of of their website at these locations.